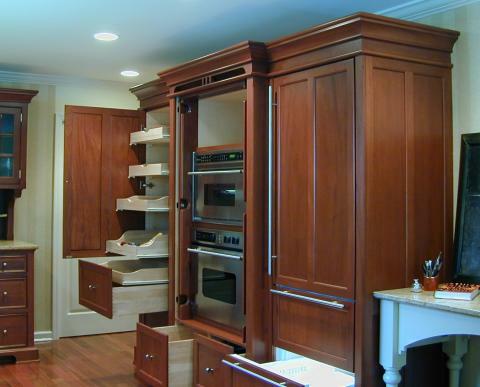 This refrigerator armoire includes two ovens & a pantry and allows the sink and cooktop workstations to fill the other spaces in this modestly sized kitchen. The refrigerator armoire handles all of the dry food and cold food requirements while the ovens support the gas cooktop workstation. The two units that are combined are a SZ15-RP-54 with a DO40-OM-T (tall). It is equipped with a Subzero 700 Refrigerator / Freezer / Ice maker, a 30″ wall oven and a 30″ microwave (w/ trim kit). The ovens are safely concealed using YesterTec’s U.L. listed technology. It is shown in Hampton’s Mahogany with matte aluminum door panels to complement the stainless steel cooktop in this condominium kitchen. 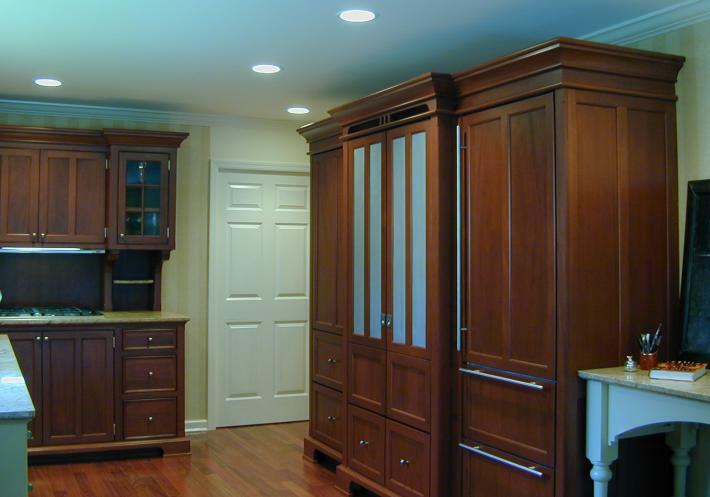 This multi-purpose refrigerator armoire is great for kitchens with limited wall space because it takes the place of all the top wall hung cabinets that would otherwise line the walls of a standard kitchen design.